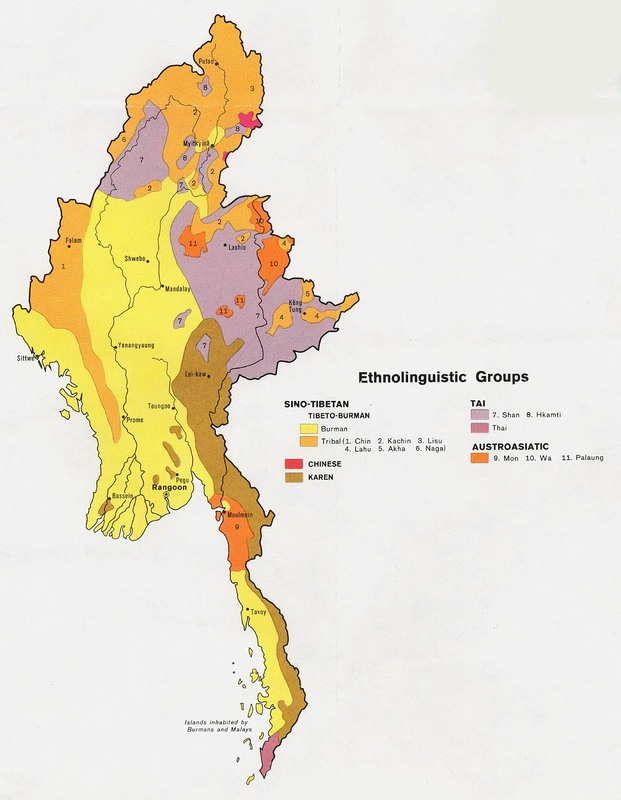 With many ethnic groups nestled within its borders, Myanmar (formerly known as Burma) has a rich cultural milieu. The Mahei of Myanmar live in the mountains and Mekong River Valley of the northeastern portion of Myanmar bordering southern China's Yunnan Province. Lacking specific information about the Mahei, this profile is based on their close ethnic and cultural relationship with the Hani and the Akha. It also draws conclusions from their location in the so-called Mae Khong River quadrangle area, which includes the border areas of China, Thailand, Myanmar, Laos, and Vietnam. Although the exact origin of this mountain tribal group is not known, legends say that their nomadic ancestors gradually migrated southward from a far away northern plain in China. Since their language-also called Mahei-is of the Tibeto-Burmese group, others believe that their origin may have been Tibet. Their culture has elaborate oral traditions and long, interrelated genealogical and ritual practices. The Hani and Akha (the related ethnic groups) are rice farmers who skillfully build their terraces on mountain and hill slopes, using irrigation canals and dams. They use different kinds of pick axes, hoes, spades, water buffalo drawn plows, and tillers for farming. Fertilizers, especially cattle dung, are used for cultivation. Cattle production is also slowly developing. The Mahei, however, are likely to be part of those who still practice "slash and burn" agriculture. They generally live far away from one another in separate groups, each with a few families. Most Mahei families are patrilineal, meaning that the line of descent is traced through the father. The father or eldest brother is the head of the family and makes all the decisions. Two to four family branches make up a clan. The members of each clan have a patronymic name (name that is derived from a common father or ancestor). Young Mahei men and women are allowed to choose their marriage partners, but they must also have parental consent. Wedding rituals vary from district to district. However, it is customary for the newlyweds to live in the home of the girl's parents for three to four years. The Mahei like handicrafts such as wickerwork, cotton weaving, and dyeing. The women are usually pictured carrying baskets on their backs, toting a baby in a sack around their shoulders, and spinning cotton with their hands. In their tradition, the respect a woman receives depends upon the number of sons and grandsons she has. The folk arts and literature of the Mahei are also fairly well developed. Many stories of literary and historic value, as well as folk tales, have been passed down orally. A number of Mahei poems are about marriage and other customs. Every year, the people in each village celebrate four to five major festivals. The most extensive one is a harvest festival called the "Tenth Moon." Each occasion exemplifies the Mahei's warm, hospitable nature. The Mahei practice their traditional ethnic religions. Most of their villages have temples where a multitude of gods are worshipped. These gods are associated with the earth, water, fire, and famous ancestors. It is also common for brothers in the same family to worship their dead parents at the eldest brother's house. On the lunar New Year's Eve, children are told about their deceased ancestors and their family lineage. Besides worshiping ancestors, the Mahei also venerate the spirits of their parents-in-law. Each year in the second lunar month, they hold a grand offering service in the village. There they pray to the spirits for health, prosperity in farming, and success in cattle breeding. In rice-growing areas, the "Thunder God" and the "Wind Ghost" are worshipped. Many rituals and ceremonies are held to honor these gods during the farming season. Christian materials are needed in the Mahei language. Increased intercession and missions efforts are necessary for reaching the Mahei with the Good News of Jesus Christ. * Scripture Prayers for the Manipuri, Ponna in Myanmar (Burma). * Ask God to strengthen, encourage, and protect the small number of Mahei Christians. * Ask the Holy Spirit to complete the work begun in the hearts of the Mahei believers through adequate discipleship. * Ask the Lord to raise up strong local churches among the Mahei.